Dictyochrysa peterseni, copyright Shaun Winterton. 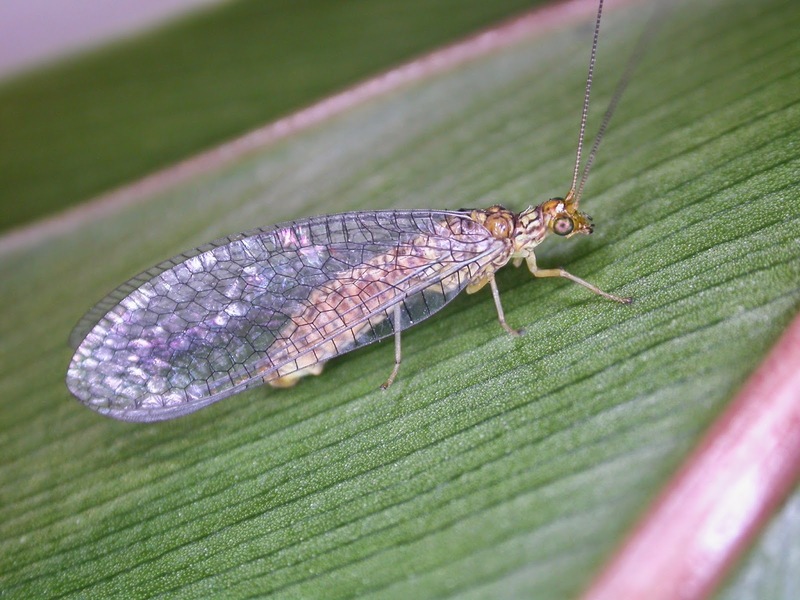 The Chrysopidae, green lacewings, are a group of lightly-built lacewings with elongate, actively hunting larvae. Characters (from Zborowski & Storey 2010): Body colour usually green, eyes metallic-coloured; antennae thin, filiform, tapering, longer than half length of forewing; wings with more vertical than longitudinal veins, outlining numerous, almost vertical, rectangular cells, which are usually clear. [FP01] Freitas, S. de, & N. D. Penny. 2001. The green lacewings (Neuroptera: Chrysopidae) of Brazilian agro-ecosystems. Proceedings of the California Academy of Sciences 52: 245–395. [N80] New, T. R. 1980. A revision of the Australian Chrysopidae (Insecta: Neuroptera). Australian Journal of Zoology, Supplementary Series 77: 1–143. [P-FD12] Pérez-de la Fuente, R., X. Delclòs, E. Peñalver, M. Speranza, J. Wierzchos, C. Ascaso & M. S. Engel. 2012. Early evolution and ecology of camouflage in insects. Proceedings of the National Academy of Sciences of the USA 109 (52): 21414–21419. [P02] Ponomarenko, A. G. 2002. Superorder Myrmeleontidea Latreille, 1802 (=Neuropteroidea Handlirsch, 1903). In: Rasnitsyn, A. P. & D. L. J. Quicke (eds) History of Insects pp. 176–189. Kluwer Academic Publishers: Dordrecht. [ZS10] Zborowski, P. & R. Storey. 2010. A Field Guide to Insects in Australia. Reed New Holland: Sydney.